Overall poor performance, a fairly buggy and incomplete release. Cutscenes are pillarboxed 16:9. Subtitles may be cut off. Resolutions above 1080p result in a glitched 1920x1080 partial render in the corner of the screen in fullscreen mode. This can be solved by setting both [MainWindow] and [Graphics] to your desired resolution in settings.ini. Choice of Off, 30 FPS, or 60 FPS V-Sync. When changing various video settings the game will crash upon saving. Upon relaunching the game the settings will be changed. There is currently no known fix for this problem. Mouse acceleration can't be disabled. 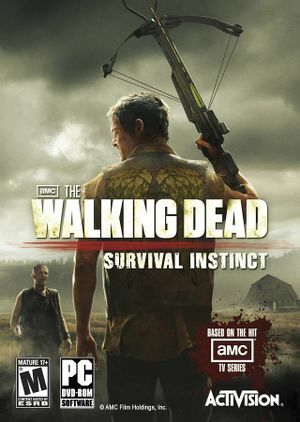 From the Steam Library, select The Walking Dead: Survival Instinct. Right Click it and choose Properties, and then go to the language tab, and change the language. ↑ 2.0 2.1 File/folder structure within this directory reflects the path(s) listed for Windows and/or Steam game data (use Wine regedit to access Windows registry paths). Games with Steam Cloud support may store data in ~/.steam/steam/userdata/<user-id>/220050/ in addition to or instead of this directory. The app ID (220050) may differ in some cases. Treat backslashes as forward slashes. See the glossary page for details. This page was last edited on 20 April 2019, at 17:22.